Miniature horses are, as expected, small…really small; usually less than 34–38 inches (86–97 cm) as measured at the last hairs of the mane, which are found at the withers. While miniature horses are the size of a very small pony, many retain horse characteristics and are considered "horses" by their respective registries. They have various colors and coat patterns. Miniature horses are friendly and interact well with people. For this reason they are often kept as family pets, though they still retain natural horse behavior, including a natural fight or flight instinct, and must be treated like an equine, even if they primarily serve as a companion animal. They are also trained as service animals, akin to assistance dogs for people with disabilities. Miniature horses are also trained for driving, equine agility, and other competitive horse show type events. According to the American Miniature Horse Association (AMHA), the smallest miniature horse breeding stallion in America was Bond Tiny Tim.In the AMHA Online stud book, Bond Tiny Tim is listed as a miniature horse stallion measuring only 19 inches tall. 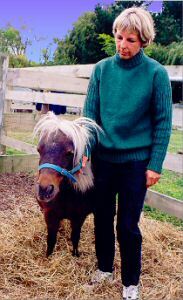 Bond Tiny Tim was a dwarf horse who was bred extensively and appears in the pedigrees of hundreds of miniature horses in America.Bond Tiny Tim sired numerous national champions and lent his dwarf genes to generations of his descendants. Miniature horses are very common and it is not necessary to spend a large amount of money to buy a miniature horse from a breeder. Every year thousands of pet-quality miniature horses are sent to slaughter and The Guide Horse Foundation recommends that you consider adopting an unwanted, abused or rescued miniature horse from a horse rescue organization or buying a miniature horse from an auction where the killer buyers attend.There are also internet miniature horse sales and owner-posted miniature horses for sale on the web. Content and Photo Source: the Guide Horse Foundation.